I don’t follow football, but I am a fan of fall, Halloween, and any excuse for some good, better-for-you, party food. However, when Halloween falls on a weekday, it can be especially tricky to get some nutritious foods into your family before you collect more than a month’s supply of dessert in less than an hour. Whether you head out trick-or-treating, or you’re planning a party for adults or teens, why not pre-game Halloween with some easy, festive, real foods? Your guests will enjoy your creative, enticing Halloween treats so much they might not even realize that you tricked them into eating healthier. Holiday traditions are important for military families because they create predictability and something to look forward to in an inherently changing lifestyle. Halloween with adorable and healthier festive foods became a tradition in my family because my oldest daughter’s birthday is the day before Halloween. In the toddler years, it was easy to trick her into eating healthier snacks if they were creative and cute. But then over the years, these fun holiday Halloween foods have become our nostalgic tradition. Of course, we still enjoy the real deal treats, including candy. But, we enjoy making these real-food ideas the forefront of our pre-game Halloween party, and the candy comes in last, as dessert should. Halloween is the start of a holiday sweeps of sorts that focuses on treats and comfort foods. You don’t have to completely deny yourself the traditional rich foods of the holidays to be healthy, but it can be hard to find balance. Whenever you can focus on eating fewer processed foods and more whole foods like fruits, vegetables, whole-fat dairy products, and unprocessed meats—real foods—it helps you build some healthy habits that last even through the holidays. 1. Figure out your main dish(es) and add a few easy sides. 2. Keep it real and simple. The less processed the food, the better. The easier, the better. 3. Enlist the help of kids or friends to make some things in advance. 4. Or to simplify even more, decide to make some options into build-your-own stations during your party. Make up a batch of candy corn quesadillas. You can use cheese, and if desired, add in some pinto beans or meat. Serve salsa, guacamole, and sour cream on the side. Try these finger-licking good, gluten-free, oven-baked chicken wings with homemade blue cheese dressing. 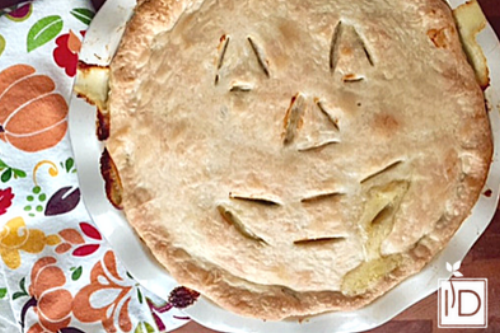 Try making this chicken pot pie and carve a jack-o-lantern out of the top crust as the vents. I usually skip the bottom crust and just use a top crust to make it a little healthier. Serve up bowls of homemade chili and cut slices of cheese into triangles and mouth shapes to allow guests to form their own jack-o-lantern faces on top of the chili. This is easiest if you buy slices of cheese and have a cookie cutter do the work for you. 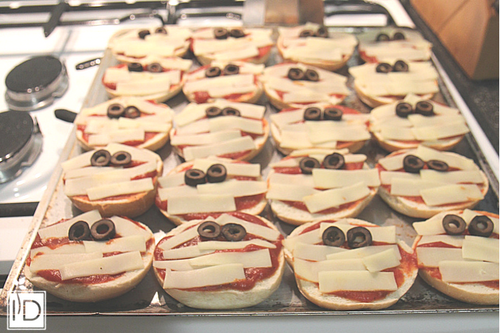 Mummy pizzas are always a hit and they can be build-your-own with bagels, sauce, and slices of Muenster (no pun intended) cheese, and olive slices as eyes. Or made in advance. Everyone needs to eat more fruits and veggies. Try using them to make your snacks look more adorable. Or better yet, have guests do it themselves. All of these are so simple and kids are usually willing to help. A veggie skeleton with this homemade garlic ranch dip is so easy and you can buy a veggie tray or hit the grocery store salad bar as a short cut to make it even easier. Try assembling these apple peanut butter bites and wait for the smiles to appear. These could be build-your-own for a fun activity. Turn deviled eggs into olive “spiders” for a creepy but classic and cute Halloween snack. It doesn’t get any easier than jack-o-lantern clementine oranges and they are the perfect small size when you have many choices on a buffet. Cheese stick fingers with cucumber fingernails are creepy yet appetizing and easy. Some may still whittle away their candy stashes quicker than you can say “Happy Halloween,” and that’s okay. You don’t want to be too restrictive, with yourself or with kids, because that can backfire. But, by pre-gaming Halloween, you’ll have done your part to fill your guests’ bellies with some nourishing, real food before the mad candy dash. Every effort you make to build habits around a fun, healthier holiday food tradition helps you and your family find a balance between real foods and treats, even when the holiday’s focus is mainly on candy. Diane is a registered dietitian, certified diabetes educator, and freelance health writer. She wanders the world with her Navy pediatrician husband and their three daughters, each born in a different country. She has made it her life’s work to savor authentic, healthy foods, grapple with and summarize nutrition science, and showcase how to make easy, real food on her blog, www.thewanderingrd.com.